We know that creating fresh content on a regular basis can be challenging. So we wanted to help our users overcome this limitation through the use of live video. Hence, we’ve recently partnered with Exterity, a leading IPTV solutions provider, to allow the addition of external video feeds to your playlist in digitalsignage.NET from a supported Hauppauge TV tuner (HVR-900H), DVD, video camera via composite or S-Video. 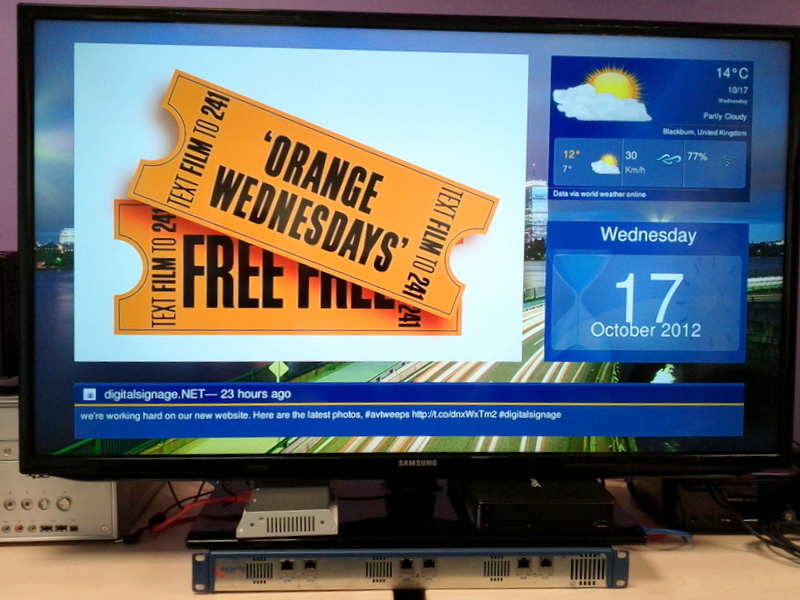 One can also play IP streams provided by an Exterity IPTV system. As a digitalsignage.NET user you can display an unlimited number of channels simultaneously (such as CCTV, TV and IPTV) without having to create separate video networks, keeping hardware and operational costs down. Leaving the technical jargon aside, the Live Video feature in digitalsignage.NET means that you can make use of dynamic, real-time content that many times you don’t even have to create (making sure you avoid any copyright infringement all the while) or you can repurpose your already- existing content. Live news, current affairs and sports programmes can now be easily incorporated into your digital signage solution with no compromise in the image quality no matter the number of digital information displays employed. The Exterity product we are using and that you can see exhibited in the photo above is AvediaStream e3635 encoder. It distributes content from sources such as Blu-Ray/ DVD Players, set top boxes, digital cameras or PC’s over your existing IP network, eliminating the need for a costly second coaxial network, as Exterity explains. This also improves the sound and signal quality that are sometimes lost over long coaxial networks. The IPTV Ready Program we’ve been part of in the last few months certifies the fact that the solution has been tested and that the two systems simply plug and play together, relieving users from the task of site testing it themselves. The new Live Video feature shows our commitment to enrich digitalsignage.NET’s content related capabilities, a process that will continue in the coming year. Click here to set up your free account and test the new feature by yourself! Check out our Support portal for a step by step guide of how to add live video feeds to a playlist in digitalsignage.NET. 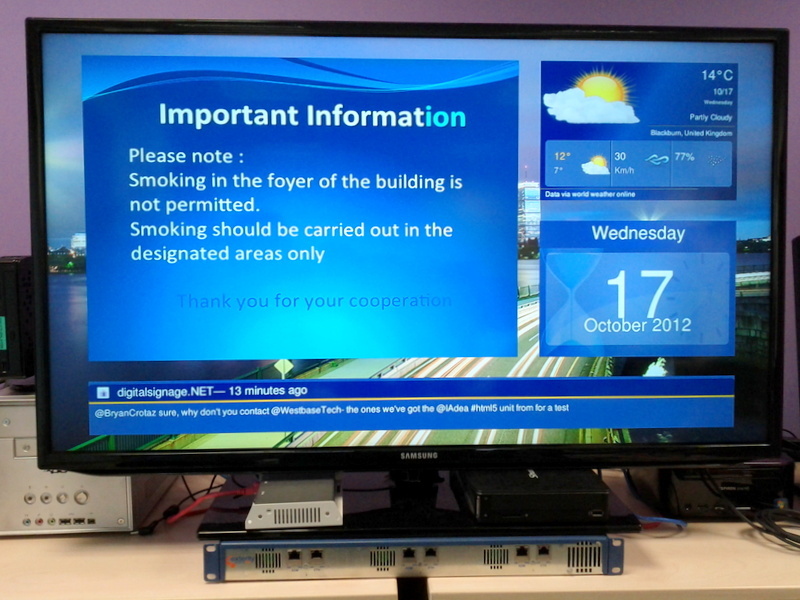 digitalsignage.NET now able to deliver Important Information in real-time thanks to Exterity’s encoder.